hi barbra, i met you at lakefarm park this summer. i was one of the artists at the “nature in the park” series. 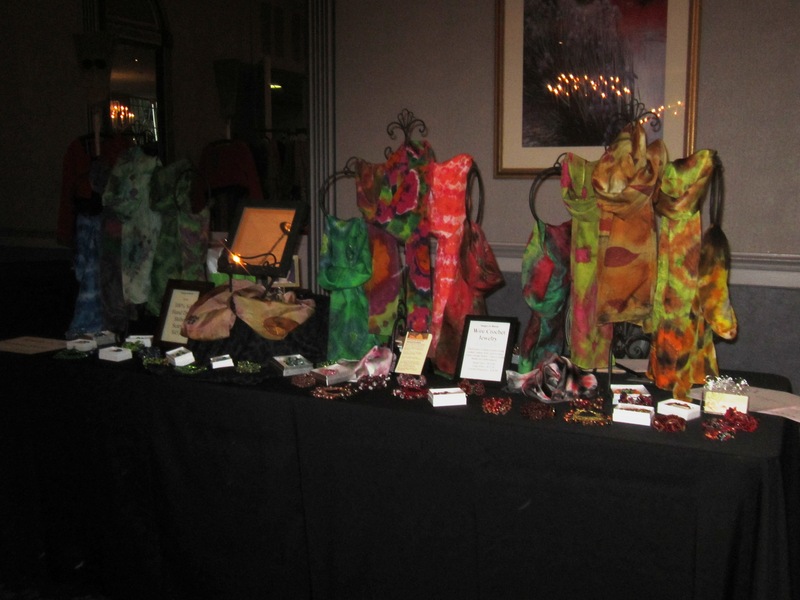 i did felting and had several scarves for sale. i have to tell you, one of your past emails an inspiration to me. i wanted to be in the TAA fashion show and have a boutique this year. buuuut was taking my time and couldn’t get going. then your email came about where you were going to be showing and my competitive spirit kicked in. so i got busy and was in the fashion show AND had a boutique! i had so much fun and was very successful. i’m sorry i didn’t get to walk around so i didn’t get to see your boutique. but i want to thank you for you emails. your work is beautiful and inspirational, one way or the other!! how did things go for you? are already a member of TAA? i’ve been to several lectures and am pretty sure i’ll join.there ia a textile guild that meets at lakefarm park. i can’t get ti the meeting as often as i like but it’s a great goup of creative women. 2nd. wed. of the month. 10am – noon. i’m not sure where you live so i don’t know if this is conveinient for you. i live in geneva & have an alpaca farm. i’m also wondering how & where you learned to develop your website. i have not found anyone to help me, plus i’d much rather be creating! i was at a family event last week and a female cousin realy encouraged me to get online with a website. that’s not the first time i’ve heard that. i’ve got to keep on persuing that “spoke in my wheel” of support. I’m Lori Weber – and I met you at Lakeland last weekend. Love your blog. Just tried to “follow” you – and there was a problem w/ the email activation. hi, am trying to determine why it would not let you follow me. i think the security on the blog just changed… i have approved and added you. i tweeked the site, and had someone else try to sign up – you are clicking the follow button that appears on the lower right corner, right? Well – if you got the notice – and I’m now an official follower of Bloom Where you’re Planted, then all’s well in the world! Thanks for looking into this. Keep up the good work!